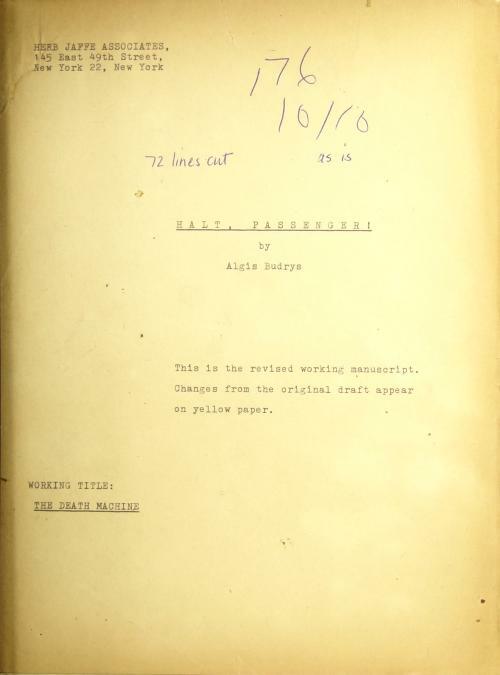 Features: ORIGINAL MANUSCRIPT. Sheets bound in a black leather hardcover binding with no lettering or stamping. Signed by Author. (Working title, THE DEATH MACHINE, published in book form as ROGUE MOON.) ORIGINAL RIBBON-COPY TYPESCRIPT. 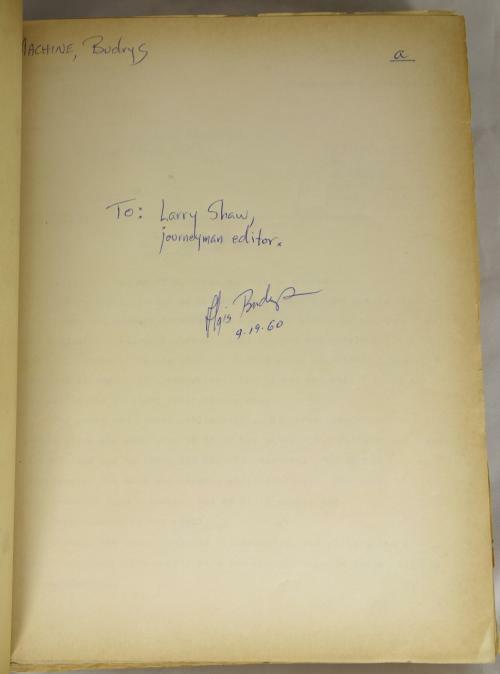 With a signed presentation, " To: Larry Shaw Journeyman Editor. 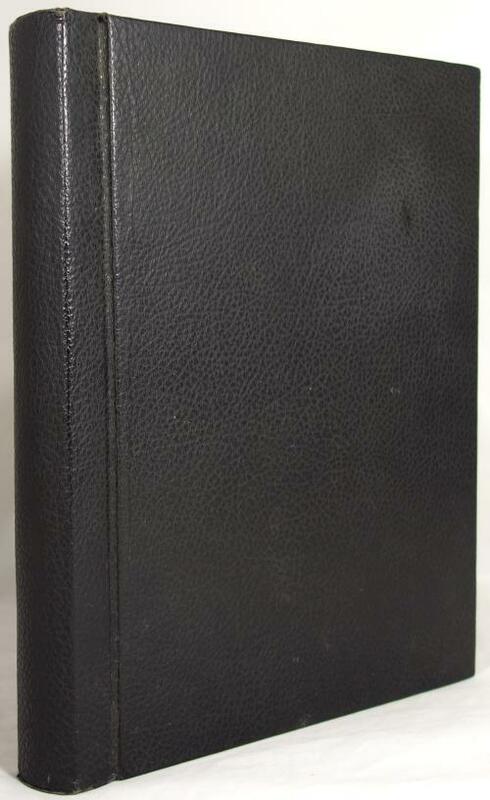 [signed] Algis Budrys 9.19.60." 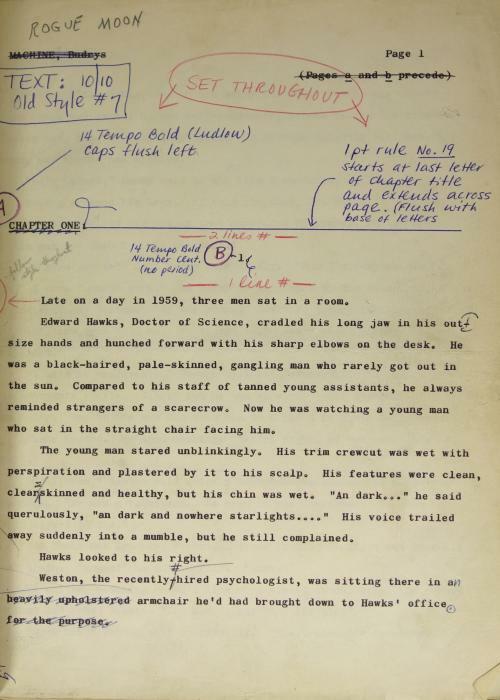 WITH corrections in the author's hand throughout. Two hundred and fifty-nine 8 1/2 x 11-inch leaves, typed double space on white and yellow paper. Many leaves have revised text glued over earlier text. Most of these revised sections have come unglued (although still bound in), revealing the earlier version of the text. Foliated and complete (although a few leaves are out of sequence). ROGUE MOON is listed in Pringle's SCIENCE FICTION: 100 BEST NOVELS. Bound in plain black boards. Nominated for the Hugo Award in 1961. From the collection of Barry R. Levin Science Fiction & Fantasy Literature. Book Condition: Very Good: The yellow-paper sections have turned brown, a few edges of leaves frayed, otherwise very good.